You will love these moist carrot cake cupcakes with the best ever whipped cream cheese frosting. 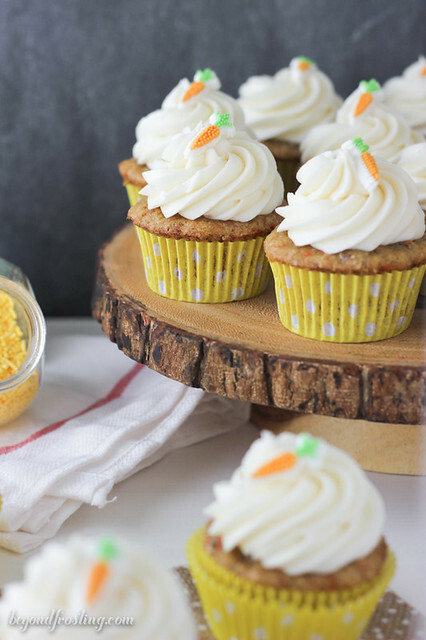 I am SO happy to be sharing these cupcakes today as we celebrate Ashton from Something Swanky. Ashton is about to have her second baby, it’s a boy in case you haven’t heard! Since we can’t all be together, there are a bunch of us bloggy friends who are throwing a virtual baby shower for Ashton! I’ve had the pleasure to meet Ashton a couple times in the past few years. She is such a sweetheart and always willing to help and answer questions. I am so glad to be celebrating her today! Ashton also has the most amazing desserts! Some of my favorites are: Funfetti S’mores Cupcakes (genius), Bacon Fat Chocolate Chip cookies (hello, where have you been all my life? ), Monster Cookie Granola (MnM’s for breakfast? Yes please!) and Fried Chicken and Bacon Donut, because DUH. Did I mention she has a cookbook dedicated entirely to Popcorn recipe? She is so talented. Check out Party Popcorn! My go-to dessert for a party is always cupcakes. Unless the host has a favorite, I usually bring one of my new flavors for everyone to try out. 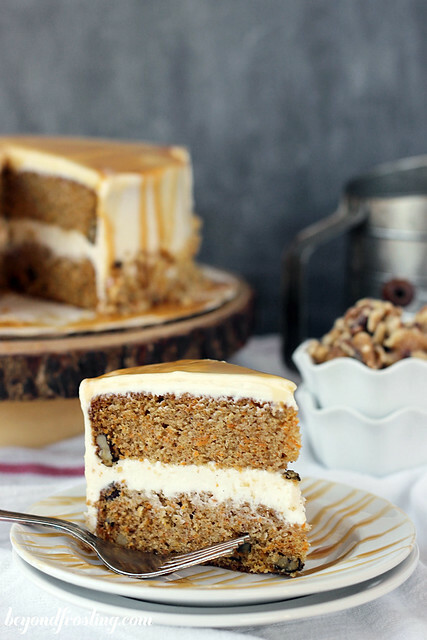 However, whenever I need a fall back dessert, I always make my Grandmother’s Carrot Cake. 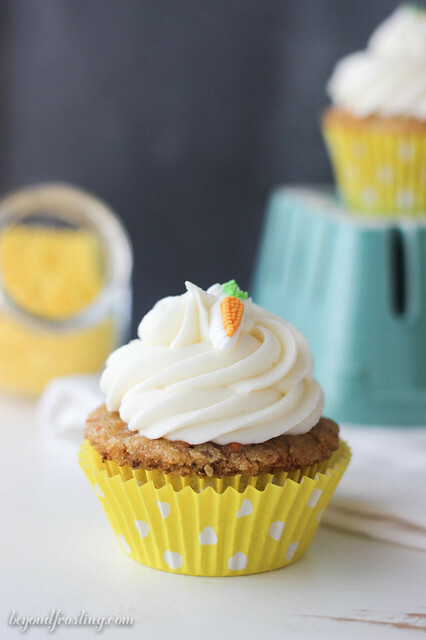 People love carrot cake, and this recipe is by far the best one I made. 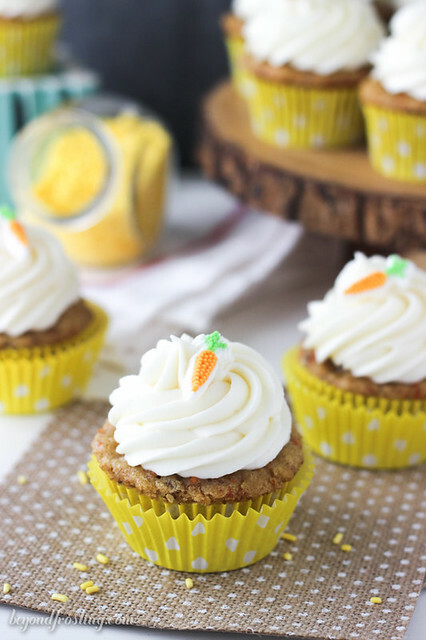 This recipe is so versatile that I even made it into a gluten-free cupcake and also a Sweet Potato Cake. This recipe is a bit different than you traditional cake because it uses oil instead of butter. The first couple steps in this recipe call for the eggs, sugar and oil to be well blended together. You should beat it for a few minutes until it appears to be lighter and more airy. You can choose to make this into a layer cake or a bundt cake instead of cupcakes too. 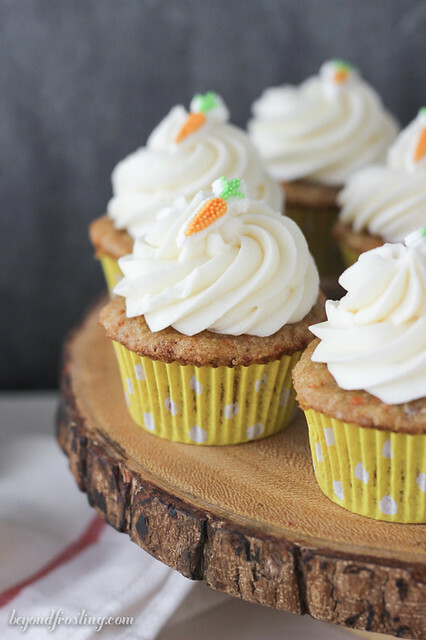 When you make these into cupcakes, they do not rise a lot. It’s okay though because you are going to cover it with the most amazing whipped cream cheese frosting! Seriously amazing. 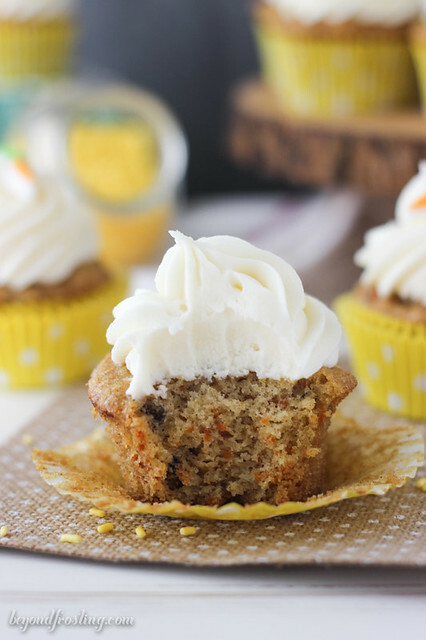 The cream cheese frosting is slightly adapted from Martha Stewart. Instead of starting with room temperature butter and cream cheese, I use it straight out of the refrigerator. This helps the frosting to be more stiff and can be piped immediately. Otherwise I would suggest to refrigerate the frosting for at least 30 minutes before piping onto the cupcake. I also use more cream cheese than the original recipe, I just love the flavor of cream cheese. 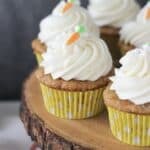 The secret to this cream cheese frosting is that it is whipped for several minutes at different stages in the process. First you should whip the butter and cream cheese until it is really smooth, this will take a few minutes since you are using cold ingredients. You may need to scrape down the bowl occasionally. Then, once all the powdered sugar is incorporated, you should beat it again for another 2-3 minutes at a high speed. The more air you incorporate the better! You know how I know this recipe is top notch (besides the facts that it’s grandma’s recipe)? 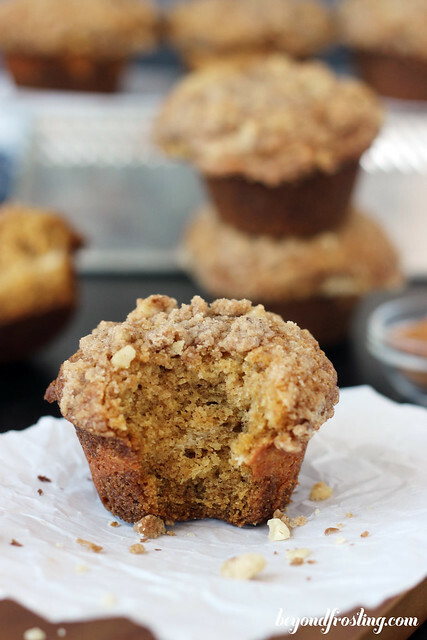 Because my boyfriend will eat it whenever I make it, especially when it is gluten-free. He doesn’t care much for sweets but there are a few things he always eats and this is one of them! Lightly beat eggs with a fork. Add sugar and beat on low speed until smooth. Add oil and continue to beat on low speed until well mixed. In a medium bowl, combine flour, baking soda, salt and cinnamon and mix together. Slowly add flour mixture to wet ingredients and beat until incorporated. Use a food processor to shred carrots into smaller pieces. Add shredded carrots to the batter and beat until combined. Fold in walnuts and raisins if desired. Bake for 18-22 minutes until slightly risen. Insert a toothpick into the center of the cupcake. If the toothpick comes out clean, your cupcakes are done.Be sure to stir the batter occasionally as you scoop into the cupcake liners. 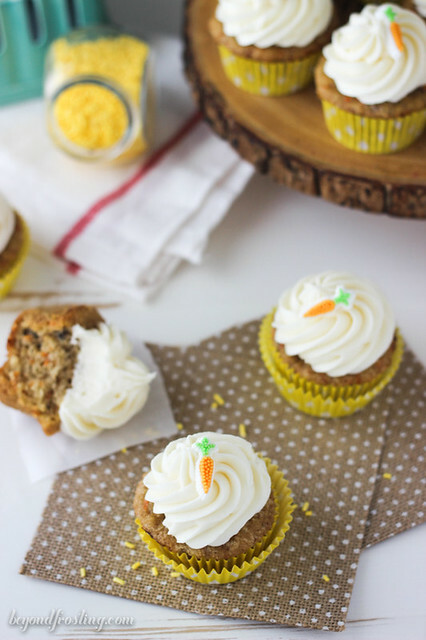 Once cooled, top your carrot cake with your favorite cream cheese recipe! Cream together butter and cream cheese until smooth and silky. Add vanilla extract until well mixed. Slowly add confectionary sugar and beat until desired consistency. I like to whip mine with the paddle attachment on my stand mixer on medium-high speed for at least 2 minutes to ensure my frosting is smooth. Add an additional 1/2 C confectionary sugar for a stiffer consistency if desired. You can refrigerate the frosting for several days. Allow the frosting to come to room temperature before using. 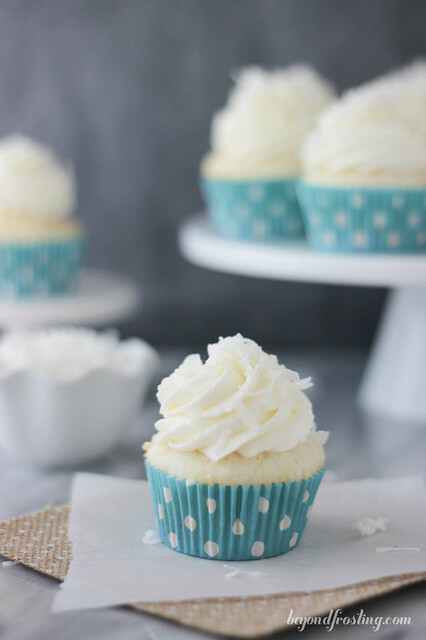 Once cupcakes are frosted, they should be refrigerated. 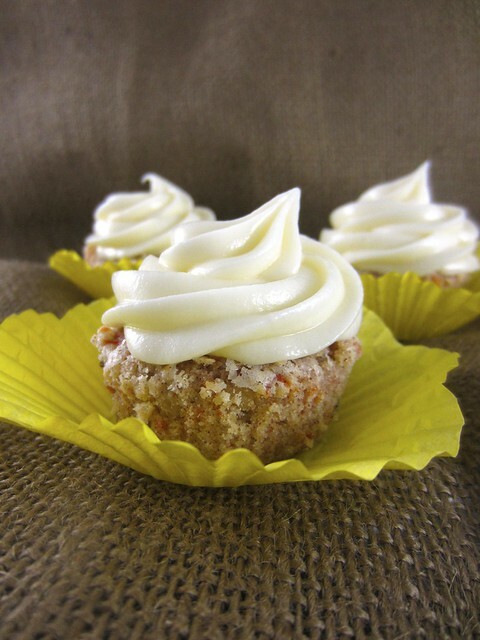 Tip: you can use a clear Vanilla extract to keep your cream cheese a pure white color. I also use shredded carrots and then put them in a food processor to chop small. 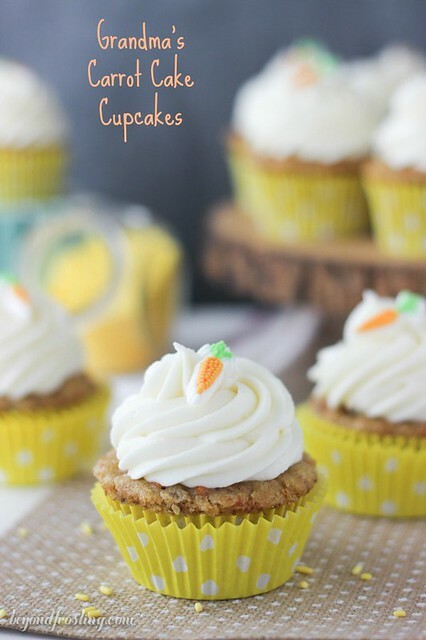 Shredded carrot are easier to work with! If using room temperature ingredients for the frosting, I like to refrigerate the frosting for about 30 minutes before I try to pipe my cupcakes. This will allow some time for the frosting to set and before a little bit stiffer so it will hold a nice shape. If you frost it right out of the mixer, it will be too soft to pipe. I came a big fun of your site. Little question.. The difference between Biscoff Frosting and this is “Biscoff and Heavy Cream” are missing in this recipe. If we want to make this frosting do you think using heavy cream can be a good idea for softening the sugar taste? Or we will ruin the frosting if we add heavy cream? More important question, would be amazing if you can answer. In ingredients it is written “2 pkg (8 oz) Cream cheese”. Is that mean 2 package of 8oz cheese cream which is total 16oz? How stable is the cream cheese frosting? Will it keep its shape at around 80F degrees without melting? Thinking about making these for a summertime garden party. Hi there, I recommend refrigerating the frosting ahead of time, and then allow the frosting to rest 2 minutes before piping and then pipe before serving. 80 degrees and sunshine is not good for any frosting.